The Russian central bank raised its main interest rates by a quarter of a percentage point, with effect from tomorrow, in an attempt to curb inflation.The minimum rate for one-day loans from the central bank in repurchase auctions will increase to 6.5 percent, the Moscow-based Bank Rossii today. The central bank has already raised interest rates once this year - by a quarter of a percentage point on Feb. 4 - in an attempt to contain rapidly rising consumer-price growth. Inflation accelerated to an annual 13.3 percent in March, the fastest pace in more than 2 1/2 years, led by food costs. The central bank also said that the refinancing rate, seen as a ceiling for borrowing money and a benchmark for calculating tax payments, will rise to 10.5 percent. The one-day swap rate, which the central bank charges for providing rubles in exchange for dollars or euros, will be 8.5 percent. The Russian central bank uses its currency reserves, the world's third largest, to buy and sell rubles as a way to limit the currency's fluctuations and influence inflation. The ruble trades against a basket comprising 0.55 dollars and 0.45 euros. IMF Warns "Russian Economy Is Overheating"
With an IMF mission due to arrive in Russia on May 22 Neven Mates, the International Monetary Fund's senior representative in Russia, said today he sees signs the nation's economy is ``overheating,'' and predicted further interest rate increases by the central bank to curb inflation. ``I certainly think there are strong signals that the Russian economy is overheating,'' including surging imports and high inflation, Mates told reporters in Moscow today. Mates said he expected the pace of inflation to be similar to last year's 11.9 percent, compared with the Economy Ministry's 9.5 estimate. Inflation accelerated to an annual 13.3 percent in March on high global food prices and oil revenue, the highest rate in over 2 1/2 years, according to the Federal Statistics Agency. The central bank raised its key interest rates at the start of February, highlighting that it views inflation as a key threat. At the same time, the government has pledged to support lenders, after the collapse of the U.S. sub-prime mortgage market sparked a global credit crisis. The Finance Ministry is offering hundreds of billions of rubles to banks in temporary loans at weekly auctions, though demand at the first last week was low. Inflation, which is seen by Mates as being a "symptom" of overheating, is encouraging Russians to spend their money rather than place it on deposit, deputy central bank chairman, Alexei Ulyukayev said on April 1. ``The population has chosen consumption over saving,'' Ulyukayev said. Mates also recommended that Russia move towards a system of inflation targeting, leaving the exchange rate to move freely, and making interest rates a more important tool in the control price increases. Both the Russian central bank and the Finance Ministry have called for moving to a floating rate. 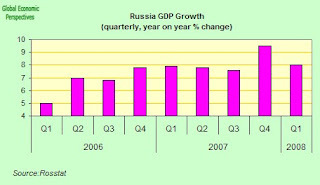 Russia's economy expanded 8 percent in the first quarterof 2008, the Economy Ministry in Moscow said today. The pace of growth was down from the 9.5% percent rate registered in Q4 2007, but up slightly on the 7.9% rate registered in Q1 2007, according to the ministry said today, citing chief forecaster Gennady Kuranov. Russia has entered its 10th consecutive year of expansion, fueled by revenue from crude oil and natural gas exports. The economy will probably expand 7.1 percent this year, compared with an earlier forecast of 6.5 percent, helped by high crude prices, Russian Finance Minister Alexei Kudrin said on April 11. 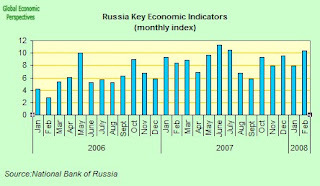 Another useful and clear indicator of the progress of Russian GDP is the monthly index of key indicators published by the Bank of Russia. The average price of Russia's Urals blend of crude rose to $93.6 a barrel in the first three months, compared with $54.2 a barrel in the first quarter of 2007, according to the Economy Ministry. Russia's Economy Ministry has revised its oil price projections for 2008 from $86 per barrel to $90 per barrel, according to an updated version of Russia's development condition scenarios prepared by the ministry. Oil price forecasts have also been altered from $75 per barrel to $78 per barrel for 2008, from $72 per barrel to $74 per barrel for 2010, and from $70 per barrel to $72 per barrel for 2011. Russia's foreign trade grew 50.3 percent in the first quarter of 2008 compared to the same period a year earlier, the Economy Ministry reported. In Q1 2007, trade increased 15.7 percent from the same quarter of the previous year. Meanwhile, according to the ministry's data, in monetary terms exports increased 55.2 percent in Q1 2008 (against 5.3 percent in Q1 2007) and imports rose 41.6 percent (against 39.7 percent in Q1 2007). Russia's Economy Ministry predicts that inflation will be 1.3-1.4 percent in April 2008, Director of the ministry's macroeconomic forecasting department Gennady Kuranov said. This year, the official said, Russia will continue to import inflation, however, this would have less significant impact. In 2007, imported inflation accounted for 3 percent, Kuranov noted. The Economy Ministry does not think inflation will top 10 percent in 2008, as it has already introduced a set of measures to curb price rise. Russia's Economy Ministry has raised its fixed investment forecast for 2008 from 14.4 to 17.8 percent, as stated in the ministry's revised scenarios of national development conditions. Projections for fixed investment growth have also been revised from 11.4 to 15 percent for 2009, from 12.4 to 13.1 percent for 2010, and from 9.6 to 10 percent for 2011. Meanwhile, the industrial production index saw only minor changes. The forecast for 2008 has been upgraded from 105.2 to 105.7, left unchanged at 105.5 percent for 2009, raised from 105.5 to 105.6 percent for 2010, and, once again, left unaltered at 105.1 percent for 2011. The Consumer Price Index (SPI) stood at 100.3 percent in Russia from April 8 to 14, 2008, Russia’s Federal State Statistics Service has reported. Since January 1, prices have climbed by 5.6 percent, rising 0.8 percent from April 1 to 14, 2008, up from 3.8 and 0.3 percent in the same periods of last year, respectively. In April 2007, inflation was reported at 0.6 percent. Prices for chicken eggs and plant oil increased the most (by 2.4 and 2.3 percent, respectively), while prices for bread, wheat flour and pasta rose slower, up 1.2-1.8 percent, down from 1.6-3.3 percent in the previous week. In 12 regions, bread prices went up by more than 3 percent. In the Jewish Autonomous Region, rye and wheat bread increased by 17.8-18.7 percent, by 13.6-15.8 percent in the Leningrad region, by 8.2-10.2 percent in the Magadan region, and by 5.4-10.6 percent in the Kaluga region. Diesel fuel and automobile gasoline prices grew 1.5-1.6 percent. Inflation in Russia stood at 4.8 percent in the first quarter of 2008, and 1.2 percent in March. From March 25 to 31 alone, consumer prices went up 0.3 percent, and they rose 0.5 percent from April 1 to 7. In late March, Russia’s Economy Ministry raised its inflation forecast for 2008 from 7-8.5 percent to 7-9.5 percent. “The inflation target for this year will have to be raised due to rising food prices, particularly grain prices,” said Gennady Kuranov, Director of the Economy Ministry’s Macroeconomic Forecasting Department. 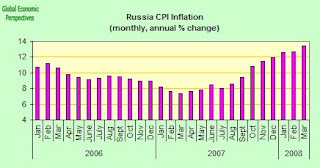 Inflation forecasts for 2009-2011 remained unchanged, Kuranov said. Inflation is expected to be between 6 and 7 percent in 2009, 5-6 percent in 2010, and 5 to 5.8 percent in 2011. Russia’s gold and foreign exchange reserves stood at $511.8 billion as of April 11, $3.8 billion or 0.75 percent up from $508 billion a week before. The reserves rose for the ninth week in a row. From February 8 to April 4, they increased by $27 billion, and in the nine weeks from February 7 to April 11 the reserves climbed by $30.8 billion, or 6.4 percent. The significant rise in such a short time could be due both to the dollar’s depreciation against the euro and the Central Bank’s increased acquisition of foreign currency on Russia’s forex market, bringing the reserves to their highest level ever recorded. As a result, Russia has slightly reduced its gap from China and Japan, which have the largest gold and foreign currency reserves in the world. China’s reserves top $1.68 trillion, up $57.3 billion in February 2008 alone, following a rise of $61.6 billion in January 2008. China is unrivalled in terms of gold and forex reserves, largely thanks to its huge trade surplus, fed by its growing exports to the United States. Japan’s reserves stood at $1.02 trillion as of the end of March, boosted by the euro’s significant appreciation against the yen and rising bond yields. Gold and foreign currency reserves are highly liquid financial assets controlled by the Central Bank and the Finance Ministry. They consist of monetary gold, special drawing rights, the reserve position in the International Monetary Fund, and foreign currency. As the economic train of the Baltics and Eastern Europe (and soon I would imagine Russia) steadily slows down while at the same time producing a tremendous amount of steam in the form of rampant inflation industrial organizations and businesses seem to be waking up to the fact that something is afoot in Eastern Europe. And what are we talking about then? Well, regular readers of this space will know the story just about as well as the chorus of their favorite rock ballad but allow me to repeat it anyway. As such and in a historical context the success of Eastern Europe after the fall of the Berlin Wall can hardly be disputed. Throughout the 1990s structural reforms were slowly but surely put in place and immediately up to as well as after the grand meeting in Copenhagen in 2004 where eight Eastern European countries were adopted into the EU (followed by Romania and Bulgaria in 2007) growth rates were very impressive. These notable growth rates were accompanied by strong capital and investment inflows as well as expectations of future growth both from the perspective of regional policy makers and foreign investors. However, you cannot escape history and even though I wholeheartedly agree with Stefan Karlsson's assertion that Eastern Europe is not a homogenous region the current region wide slowdown and lingering risk of stagflation/deflation do seem to mark a structural break. Contrary to what you might expect it is not these countries' Communist and Soviet history that haunts them but rather a demographic ghost which emerged in the midst of the region at the beginning of the 1990s. Thus almost two decades worth of lowest low fertility (i.e. at TFR below 1.5) as well as a steady outward trickle of labour of the prime vintage to Western Europe are now showing its effect in the form of adding to an increasingly tighter labour market and ensuing inflation and rising wage costs. Slowly but surely, the mainstream media and business managers are thus beginning to wake up the inescapable fact that the biggest risk they now face in the context of Eastern Europe and beyond is not dodgy institutions but missing labour. A while ago in my continuous coverage of Lithuania I noted that Bloomberg, in one of their small news snippets, were relating the dropping unemployment rate and subsequent inflation and wage cost issues to net outward migration. From this point it is not a big leap to the inclusion of core demographic variables such as most notably fertility. This worrying fact of missing labour to feed the cranes, factories and offices of western companies marching East is beginning to show up all across the board not least in the former cheap sweatshop of the world China where we recently learned how those hitherto labour abundant rural areas are running dangerously dry. A couple of recent pieces by Reuters and Bloomberg respectively further intensifies this change in discourse. Reuters' Simun Shuster takes us to Russia which is fast becoming anything but the promised land foreign investors marked it out to be. The main problem as you might have expected is a latent shortage of labour which is fuelling wage costs and inflation with the important and much cited point that the former by far out paces the growth in productivity. As could have been expected this tendency is rolling in much to the chagrin of foreign executives and HR managers. "There needs to be a balance between the quality of the labour and its cost ... Once that balance is broken, the future of this economy loses its promise,"
This is a discussion about quality then rather than quantity and this also leads to a positive spin of the current situation by Russian authorities and interest groups. "Will this scare away foreign investors? Yes, absolutely. This is what we need, to scare away the speculators and slave traders. The responsible employers will stay," Shmakov [head of Russian trade union] said. "Russian workers are not Chinese workers. We will fight." However, if we consult the underlying state of Russian demographics it is very easy to plug holes in this positive narrative. As such, both in terms of quantity and quality Russia's labour market is in a very poor condition. As in all other countries in the Eastern European edifice fertility has been at rock-bottom for nearly two decades. Even though Russia remains a magnet for intra-regional migration flows her overall population is still declining. And when it comes to quality the news is not much better. A lingering and rising problem with AIDS and a persistently too comfortable relationship with alcohol are showing up in aggregate statistics in the form of an appalling track record in terms of male life expectancy. With this as a backdrop and keeping in mind that the current inflation and wage issues are set to continue the human capital foundation is by far the biggest challenge for Russia's economy even though some would also argue that the ongoing poor state of societal and political institutions are equally important. I am of course painting too much of an ominous picture here. But the message from Shuster's piece is not to be taken lightly. Business comes to Russia to invest, in expectations of conditions which are not present. At all points in time economic growth on a microeconomic as well as a macroeconomic level is primarily driven by people, especially in the context of Russia and Eastern Europe where re-locations have been made in expectations of relatively cheap and abundant labour not to mention the access to a growing middle class with purchasing power to buy more than the bare necessities. It thus my argument that at the heart of the predicament is a mismatch between the process of economic and institutional development which is fairly well known and documented and then a less known but crucial process known as the demographic transition. This is also why I have always felt that Goldman's old 'BRIC economy' narrative should not include the R for Russia since Russia is completely different from the rest. Moreover, one of the big challenges globally will be to make sure China does not go down the same road in terms of a mismatch between expectations of and actual growth potential. Sadly, it seems as if this may precisely what is about to occur in China now in the sense that inflation now seems to have taken an effective hold. Turning to the piece by Bloomberg authored by James M. Gomez and Andrea Dudikova it echoes the themes from Simon Shuster's piece. However, in stead of focusing on one country Bloomberg presents a veritable tableau d'horreur of stories by companies and business managers and how they cope with the reality of labour scarcity. The main theme, as I have been chanting endlessly here, is that the Eastern European growth story itself is now threatened by the erosion of the human capital foundation. As for concrete examples? Well, why don't we have a look at the travails of one my fellow country men. Indeed as you can see, the honeymoon stage enjoyed by foreign business in Eastern Europe is now clearly over. But what are the solutions then? Well, one obvious solution is to substitute man for machine as we learn Volkswagen is contemplating on a number of their factories. Of course this begs the question of who is actually going to buy all those Passats and Golfs but that will be for another day. Another reply by foreign investors which I find more interesting is the common call to peer further to the East. Thus and contrary to what the Pet Shop Boys sang in 1992 business managers across Europe are readying themselves for an expedition to the East in order to satisfy their hunger for human capital. Gomez' and Dudikova's article even commences with a quote by Jiri Cerny employed by the PSA group in the Czech Republic noting that the company was now eyeing Mongolia as a potential labour repository. And before you dismiss this completely I would recommend that you had a look at Edward's recent potboiler on the Czech Republic over at Global Economy Matters which indeed shows that Mongolians are steadily but surely making their presence felt in the Czech Republic; and so, by the way, are the Vietnamese. In the end and as companies across Eastern and Western Europe saddle up for a trip across the Ural and then on to the barren lands of Siberia the main question remains as to what exactly is going on. I mean, where are all the people? Above I have tried to present my answer. And as all those business and HR managers work their way across the Asian mainland they will perhaps even venture a trip to the Kamchatka Peninsula. There, I will be sitting in my hut offering a nice pot of cod, scallop and squid and over my premises will be a sign, bent in neon, reading; "Yes Virginia, fertility does matter." The Russian government's budget surplus accounted for 6.6 percent of gross domestic product in the first quarter, the Finance Ministry said today, citing preliminary figures. The surplus rose to 548.94 billion rubles ($23.41 billion) from 416.7 billion rubles in February. Revenue reached 1.9 trillion rubles, or 24 percent of the amount the government planned to receive for 2008, according to the statement. Spending was 19 percent of planned expenditures for the period. Expenditures rose by 39 percent in 2007 and included spending on Russia's development bank and other new state-run institutions that seek to boost industries outside of natural resources, according to Kudrin. The budget surplus slid to 1.78 trillion rubles last year from a record 2 trillion rubles in 2006. Foreign car sales in Russia were up 54 percent year on year in the first quarter of 2007, to 454,069 vehicles, the Association of European Businesses said today. Chevrolet were the most popular, with 58,498 vehicles sold in the quarter, or 59 percent more than last year. The numbers include sales of the Chevy-Niva sports-utility vehicle, which is produced at GM's venture with OAO AvtoVAZ, Russia's biggest carmaker. Three of the top five selling brands are locally produced, the statement said. Sales grew 44 percent in March. Renault SA Chief Executive Officer Carlos Ghosn is predicting that Russia will overtake Germany to become Europe's biggest car market within two years. The Russian car market, spurred by an economy that has entered its 10th consecutive year of growth, had sales of more than 2.3 million vehicles last year, compared with 3.15 million in Germany. Russians spent a record $53.4 billion on cars last year, 67 percent more than in 2006, PricewaterhouseCoopers LLP said in January. As demand increases, Renault, Ford Motor Co., General Motors Corp., Toyota Motor and Volkswagen AG have started production in Russia or are building plants, but building them is one thing, and finding the staff to work in them another. Labour disputes have hit three major employers in Russia in two weeks, signalling severe tightness in the labour market that could send costs soaring for investors, said experts, employers and union leaders. 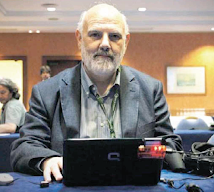 and Mac Broderick in the Moscow Times (St Petersburg, Detroit of the North). Despite St. Petersburg's economic growth, the city's population has not expanded over the past few years. Demand for labor far outstrips supply, with manufacturing leaders speaking of labor shortages as a very real problem constraining the city's growth. The city and federal governments need to formulate a policy that will ensure that the most capable engineers can come from across Russia to where they are needed most. Labor mobility will help local manufacturers take advantage of economies of scale and continue to build on their investments in St. Petersburg as opposed to looking elsewhere. Simplifying the work-permit and visa procedures for foreign workers would also help to ensure that companies have the requisite personnel to grow. As labor costs rise in Russia and the ruble appreciates, these measures will be especially important. . In part whether or not the predictions about Russian car demand comes true depends on what happens to oil production. Finance Minister Alexei Kudrin has urged the government to "remember the risks" that come with Russia's reliance on oil revenue and said spending growth should be slowed. Kudrin spoke on April 8 at a meeting with Sergey Ignatiev, the Russian central bank chairman, and Cabinet members including Economy Minister Elvira Nabiullina. "The output level we have today is a plateau, stagnation," Khristenko is quoted as saying "We hope the debate on tax changes will be complete within two or three months." Khristenko, a former acting prime minister who has overseen the world's largest energy industry for four years, said he and Finance MinisterKudrin have agreed on draft tax legislation. The only remaining question is how big the cut is going to be. Finance Minister Alexei Kudrin said last month that the government may cut its crude-extraction tax by 100 billion rubles to spur development of harder-to-reach deposits. Industry experts remain, however, sceptical that such measures can be effective. Output may fall for the first time in a decade this year as producers struggle with soaring costs and aging fields. Production in Russia, which is the world's the largest oil supplier after Saudi Arabia, declined 1.3 percent in March to 9.76 million barrels per day compared with March 2007. Natural Resources Minister Yuri Trutnev warned last month that 2008 could see a drop in output for the first time since 1998. So the question really is can Russia get its inflation problem sufficiently under control, and its domestic industry sufficiently competitive to overcome the present one sided over dependence on oil and other commodity incomes. An interesting question indeed. Russian oil production has peaked and may never return to current levels, one of the country’s top energy executives has warned, fuelling concerns that the world’s biggest oil producers cannot keep up with rampant Asian demand. The warning comes as crude oil prices are trading near their record high of $112 a barrel, stoking inflation in many countries. Leonid Fedun, the 52-year-old vice-president of Lukoil, Russia’s largest independent oil company, told the Financial Times he believed last year’s Russian oil production of about 10m barrels a day was the highest he would see “in his lifetime”. Russia is the world’s second biggest oil producer. Mr Fedun compared Russia with the North Sea and Mexico, where oil production is declining dramatically, saying that in the oil-rich region of western Siberia, the mainstay of Russian output, “the period of intense oil production [growth] is over”. The Russian government has so far admitted that production growth has stagnated, but has shied away from admitting that post-Soviet output has peaked. Russian consumer prices inflation accelerated in March to an annual rate of 13.4% (Bank of Russia data), up from 12.7% in February, led by bread, vegetables and other food costs. Prices rose 1.2 percent from February, according to data from the Moscow-based Federal Statistics Office earlier today. Russian prices have already risen 4.8 percent so far this year (January to March). Russia, which is the world's biggest energy exporter, is struggling to bring down the inflation rate to 9.5 percent this year from 11.9 percent in 2007 as money from oil and gas sales, strong wage pressures resulting from widespread labor shortages and rising global food prices fuel consumer price growth. Inflation reached 12.7 percent in February, the highest since July 2005. Food prices rose 2 percent in March, including a 4.3 percent increase in bread, according to the Statistics Service. The cost of the staple food basket reached a monthly average of 1,993.5 rubles ($84.52) in Russia and 2,231.7 in Moscow, the country's biggest city. Central bank Chairman Sergey Ignatiev said on April 2 that it is still possible to hold inflation below 10 percent this year, but this view may well be way too optimistic. Ignatiev said the bank "doesn't exclude the possibility" of a further increase to its refinancing rate and to the mandatory reserve requirements as a means to combat inflation. The bank raised the refinancing rate by a quarter of a percentage point on Feb. 4 and increased reserve requirements for banks on March 1. Prices for chicken eggs and plant oil increased the most (by 2.4 and 2.3 percent, respectively, and remember this is during only one week), while prices for bread, wheat flour and pasta rose slower, up 1.2-1.8 percent, which was slower than the 1.6-3.3 percent in the previous week. According to Simon Shuster in this article, Russian industry is increasingly facing wage disputes from workers who are now anxious to flex their muscles given their relatively advantageous short supply situation. The Russian government desperately wants wage growth to come into line with the growth in productivity but, as Schuster points out, Russian workers have grown used to rapid income growth, as wages have grown around 10 percent a year in real terms since 2000. The average monthly wage in February 2008 was Rbs15,214 ($650, €408, £327) – up 15 per cent in real terms in a year, and a sixfold nominal rise since 2000. But the rise is far from uniform and the Hay consulting group found in 2007 - reflecting rapidly rising demand for and shortages of senior executives, that managers of big industrial companies had seen annual pay jump 60 per cent in a year (to nearly $160,000). Ford who were once one of the most vocal advocates of foreign investment in Russia, got a first-hand taste of Russian labour trends last December when a major strike brought its St. Petersburg assembly lines to a halt. Hundreds of workers initially called for a 50 percent raise from the U.S. automotive giant. The demand was negotiated down to 16-21 percent, but the message to Ford and its peers seems to be getting home. Andrei Bader, head of corporate affairs at Nestle Russia, is quoted as saying that "There is simply no one to work here, especially specialised workers, skilled workers. This is a systemic problem in Russia,". And the data suggest it is only getting worse. In some ways the figures speak for themselves, since the Russian population has been in decline since 1996, while the number of people older than 65 has increased by 12 percent, according to the State Statistics Service. Over roughly the same period, the number of man-hours lost each year to strikes has grown eightfold, reaching an average of 1,231 hours for every employer affected in 2006, the year the statistics service last published strike figures. And the problem isn't just a Russian one. It is becoming fairly general all over Eastern Europe. According to this article in Bloomberg this morning, Jiri Cerny, vice president of Toyot and PSA Peugeot Citroen's joint venture in the Czech Republic, says that three years after opening shop it's getting harder by the day to find workers, and he is now actively considering importing them from Mongolia. Companies that were attracted to formerly communist nations in eastern Europe by the promise of cheap and plentiful labor are finding less of both, as faster growth drives up wages and open borders encourage emigration. Indeed there is increasing speculation that accelerating inflation may cause eastern Europe's investment- led boom to fizzle (and possibly even crash to a dead stop), with the Baltics and Balkans regions already threatened by a "hard landing" according to the International Monetary Fund and Standard & Poor's. Arkady Dvorkovich, President Vladimir Putin’s chief economic adviser, says the answer (to Russia's labour shortage problem) is investment in education, especially in management and engineering. Education spending has more than doubled from Rbs162bn in 2005 to a budgeted Rbs330bn this year. Mr Dvorkovich is less concerned about the overall labour market. He says that despite recent increases, Russia’s labour productivity is very low – standing at 12 to 15 per cent of developed country standards – and the scope for redeploying labour is huge. “With increased productivity, we will not have any shortage of labour in the future,” he said. But others are not so sure. Economists say redeployment requires more flexible labour laws. Also, given Russia’s size, poor transport and inadequate housing, people are reluctant to move. Yevgeny Gavrilenkov, chief economist at Troika Dialog, an investment bank, says the government must boost mobility through efficient infrastructure investment. Such support will be more necessary as the population declines at rates unprecedented among industrialised nations, owing to low birth rates, poor healthcare and high levels of accidents and alcoholism. The working-age population has just passed its post-Soviet peak of 90m – out of a total of 140m – and is forecast to fall to 77m by 2020.The official employment rate is already reasonably high by developed world standards, so the scope for further gains is limited. Mr Gryzlov appealed for 20m ethnic Russians living outside the country to return home. Russia has long encouraged ethnic Russian immigrants and discouraged others, reflecting widespread anti-foreigner prejudices. But, in practice, millions of illegal migrants from central Asia and the Caucasus work in low-paid jobs. Russian service industries including banking, telecommunications and hospitality expanded at a slightly slower pace in March than in February but still put in a "robust performance" according to the latest report on VTB Bank Europe's purchasing managers index of services growth, which declined to 57.2 in March from 57.5 in February. A figure above 50 on a PMI indicates expansion, and the seasonally adjusted services PMI is a composite of five differently weighted indexes including new business, business activity, employment, outstanding business and future business, according to VTB. VTB surveyed 300 purchasing managers at service companies. The Russian economy is currently in its 10th consecutive year of economic growth, which is being boosted by rising wages and increased spending. Retail sales rose an annual 17 percent in February and wages increased 13.3 percent, reaching a monthly average of 15,214 rubles ($640), according to the Federal Statistics Service. The survey did note however that rising fuel and labor costs were increasingly putting pressure on employers and this had resulted in slower new jobs growth in March. Russian manufacturing expanded in March at the same pace as in March according to the latest reading on the VTB Bank Europe's Purchasing Managers' Manufacturing Index for Russia, which held steady at 54.6, when it dropped from a 17-month high, a gauge of industrial production showed, the same pace as in February but down from the seventeen month high of 55.3 attained in January. A figure above 50 indicates growth, below 50 a contraction. The bank surveyed 300 purchasing executives among Russian manufacturers. ``The Russian manufacturing sector maintained growth at an elevated level in March,'' Dmitry Fedotkin, an economist at VTB, said in the statement. ``Rapid growth'' was recorded for new orders and output, while employment rose, he said. Imports to Russia, the world's biggest oil and gas exporter, grew faster last year than in 2006 as rising incomes and investment fueled demand for manufactured goods. Import growth accelerated to 35 percent in 2007 as the trade surplus narrowed 5.1 percent, according to the latest data from the central bank.